How does an investment this profitable go unnoticed for so long? Since going public on December 30, 1987, it has gained a staggering 4,477%. A $1,000 investment grew into $45,774. Had you invested $10,000, it would now be worth $457,740. In that time, it has beaten the pants off of some of America’s most legendary companies — companies like IBM, GE, American Express, Boeing, Caterpillar, Chevron, Disney, Procter & Gamble, DuPont, and energy giant ExxonMobil. It’s even been profitable this year (in 2016). While the Dow had its worse January in its history, this stock not only made a new record high, but it gained +9% while the tech-heavy NASDAQ lost a bone-crushing 10% in the same month! And check this out: The amount of shares that trade each day for this stock is less than what is traded every five minutes for Google. That’s how obscure this company is. Yet it has been a better investment than 80% of the companies currently in the Dow Jones Industrial Index, long considered to be the very best companies in the world. Given its incredible track record of providing safe and steady returns to its investors, it may surprise you that you won’t read about this particular investment or its industry in any mainstream investment papers or magazines. It never makes the cover of Forbes or Barron’s. And the Wall Street Journal hardly ever devotes an entire article to it. Quite frankly, the industry it’s in is boring… until you need it. But don’t let the fact that it’s ignored by most investors fool you. The lack of media publicity doesn’t explain how vital it is to the global economy. Nor does it explain how successful it’s been for its shareholders. No, it’s not technology or a technology stock. No, it’s not a retail, wireless, electric car, or biotech stock. And this has caught the attention of some of the most powerful investors in the world, who have been quietly amassing significant positions in this commodity. I’m talking about investment banking powerhouses like Goldman Sachs, JP Morgan Chase, Citigroup, UBS, Deutsche Bank, Barclays Bank, the Blackstone Group, Allianz, and HSBC, among others… all who are trying to consolidate their control over it. Even the $36 billion Harvard Endowment Fund is buying the “ultimate commodity.” Since 2012, it’s purchased $60 million worth of it in the state of California alone. Even the oil giant nation of Saudi Arabia has jumped into the “ultimate commodity.” CNBC reported in January 2016 that the Kingdom had purchased $80 million of it in California and Arizona in the past two years, much to the dismay of local residents. But why such a dramatic statement? In fact, the tentacles of the “ultimate commodity” reach so far into our modern-day economy and society that life as we know it would be altered beyond recognition if we suddenly didn’t have access to a steady supply of it. Without it, the transportation industry would come to a grinding halt. And boats would remain tied to the docks. That’s frightening when you think about the potential ramifications of a near-complete shutdown of our transportation system. One scenario is that grocery store shelves would go bare because delivery trucks would be unable to fill up their tanks with the diesel or gasoline needed to drive to the stores. Modern-day communication would be limited at best, cease to exist at worst. Imagine a week without Internet access… or even just a few days! You’d be unable to make or receive calls on your cell phone. Televisions and radios would go silent. So as you can see, practically nothing would be spared. And that’s exactly why I’m recommending this company’s stock for immediate purchase. You’ve heard the investment slogan “crisis equals opportunity” before, I’m sure. And it’s true. Right now, across the globe — and especially in the United States — we’re facing a crisis of epic proportions because of the lack of this vital commodity. And the concern has even made its way to the White House. Why is this important? Well, the year Obama uttered that warning, this company’s stock (featured in this exclusive report) gained 21%. It was a huge year for its investors. You see, that same year, the Dow managed to eke out a gain of 8%. The S&P 500, 12%. So the obscure stock I’m talking about more than doubled the Dow and outperformed the S&P 500 by 75%. Like I just said: crisis equals opportunity. I don’t always agree with the New York Times. But I do on this. Investing in the ultimate commodity is a no-brainer, in my book. Returned investors 4,477% since going public in 1987. And of the 28 years it’s been publicly traded, this company’s stock has had only five losing years. Only five! That’s pretty impressive, right? It sure is. In 2015, the Dow Jones Industrials closed the year down 3%. That means if you owned any investments indexed to the performance of the Dow (like ETFs or indexed mutual funds), you lost money. But not with our obscure “Ultimate Commodity Stock.” It closed out 2015 with a sweet return of 14%. It even beat the mighty, tech-heavy NASDAQ. Out of all the major indexes, the NASDAQ was the only one to finish the year positive, with a gain of 5.6%. I won’t deny that 5.6% is a respectable return. But our “Ultimate Commodity Stock” more than doubled it! When you add up all of the numbers, our “Ultimate Commodity Stock” has an 82% win record. And because it controls the most precious commodity on the planet, it’s almost guaranteed to continue its win streak for years to come. So what exactly am I talking about? What’s the “ultimate commodity”? Well, if you haven’t guessed by now, the scarce resource I’m talking about is water… and the obscure stock I’m recommending for immediate purchase is a pure-play water stock. That’s right: water. The nectar of the gods! It really doesn’t get any easier to understand… and quite frankly, it doesn’t get any more profitable than that. But let me emphasize: This is not one of those pie-in-the-sky water technology stocks that produces water out of thin air. It simply supplies safe drinking water to over 3 million households. And it’s been doing it for a very long time. In fact, it may surprise you to know how long it’s been doing it. The company was originally started in 1886 by a bunch of college professors to supply water to a small town in Pennsylvania. Since then, the company has expanded to 12 other states… 2015 marks the 70th consecutive year it has paid a quarterly dividend… and since going public in 1987, it’s increased its cash dividend 24 times in the last 23 years. That’s not a bad track record for something we take for granted. Water as an investment is the greatest untold story in the market today. But considering the bone-crushing drought in the western United States and around the globe in areas like the Middle East and Africa, water is THE commodity investment of the 21st century. And like I said earlier, the water market available to everyday investors like you and me is tiny. There are only a handful of pure water plays trading on U.S. domestic exchanges. But when the masses begin to pile into water companies, it’ll take their stocks to much higher levels. That’s why the time to invest in water is now. And the water stock I’m recommending not only provides you with significant capital gains (remember, it has beaten the likes of IBM, Boeing, Caterpillar, DuPont, Verizon, and pharmaceutical giant Merck since going public), but also gives you a safe and steady dividend. And because water is vital to everything we do, I’m willing to bet those cash dividends will continue to increase for years to come. So let me break it down in very understandable, everyday terms for you: Every time somebody pours a glass of water from the kitchen sink, does a load of laundry, takes a shower, or cooks a big pot of homemade chicken noodle soup, this company is getting paid. Every time. The United States — and the rest of the globe, for that matter — is in a desperate search for clean, drinkable water… The current drought almost guarantees that companies in the water business are going to be exceptional investments for years to come. And this water company I’m about to reveal to you — the one that’s set to profit from America’s current water crisis — is one of the landmark plays in my service. Except this company is 99% cheaper than Apple. Now, before I reveal the “Ultimate Commodity Stock” to you, let me explain why the world is in a historic water crisis… a crisis so bad that nations like Saudi Arabia and other Persian Gulf countries are buying up farmland in the U.S. Southwest to “export” water back to the Middle East. Thanks to the worst drought in more than 1,000 years, the western third of the United States is facing the greatest water crisis it has ever seen. Let me give you an example. Take Lake Mead. Formed by the Hoover Dam in the 1930s, Lake Mead is the largest water reservoir in the U.S. when it is at full capacity. It’s a vital resource, serving water to 20 million residents and farmland in Arizona, Nevada, and California. But because of years of consecutive drought, Lake Mead is now the lowest it has ever been. California residents have taken matters into their own hands. Water theft is now rampant. As you read this, in a desperate attempt to maintain somewhat normal levels of water consumption, water is being pumped out of the ground in these states at an absolutely staggering pace. Once that irreplaceable groundwater is gone, that is when the real crisis will begin. If this multi-year drought stretches on and becomes the “mega-drought” that a lot of scientists are now warning about, life as we know it in much of the country is going to be fundamentally different. And not in a positive way. Let me put it another way: The current drought in the western United States is not a normal drought. What the western half of the nation is experiencing right now is highly unusual. In fact, scientists tell us that California has not seen anything quite like this in at least 1,200 years. Much of the state of California was once a desert, and much of it is turning back into a desert. The same thing can also be said about much of Arizona and Nevada, whose largest cities — Phoenix and Las Vegas — continue to be among the fastest growing in the U.S.
And with Lake Mead hitting new record lows, this crisis could turn deadly. “We’re only at 38 percent full. Lake Mead hasn’t been this low since we were filling it in the 1930s,” said a spokeswoman for the U.S. Bureau of Reclamation in Las Vegas. If it gets much lower — and with summer approaching and a dwindling snowpack available to replenish it, that looks likely — official rationing will begin for Arizona and Nevada. But it gets much, much worse. You see, Lake Mead’s water comes from the once-mighty Colorado River. Providing water to 40 million people and serving seven states including California, the Colorado River is in its 16th straight year of drought. It’s being depleted at such an alarming rate that the river no longer reaches the ocean. And because the river is slowly dying, an enormous amount of water is being pumped out of the ground just to maintain the status quo. The same kind of thing is going on in the middle part of the country. 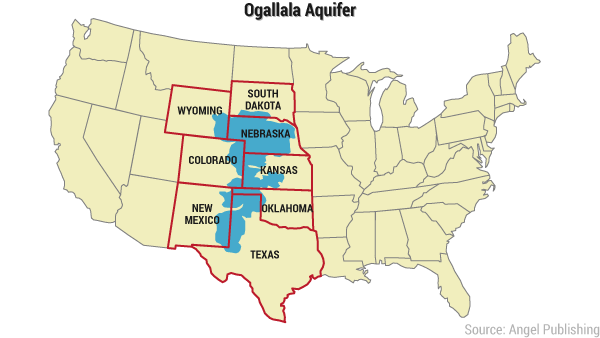 Farmers are pumping water out of the rapidly shrinking Ogallala Aquifer (which sits under the states of South Dakota, Wyoming, Nebraska, Colorado, Kansas, Oklahoma, New Mexico, and Texas) so fast that a major crisis in the years ahead is virtually guaranteed. Take the example of Porterville, California. Nestled in the rolling hills of California’s Sequoia National Park, Porterville could be what the future looks like for a lot of American towns and cities. A year ago, Porterville finally succumbed to the unrelenting drought: its wells went dry. Living day-to-day in a community without running water finally wore the Serrato family down. Their shallow well went dry more than a year ago, along with the wells of nearly a thousand nearby homes. The family of five turned to a government-provided emergency tank, conserving its contents like misers. A bucket of water for bathing replaced showers. A cup of water sufficed for brushing teeth. Nightly trips to the toilet required a walk outdoors to fetch a bucket for flushing. “It was like the end of the world,” Yolanda Serrato said. Now, you might be wondering why my investment service that focuses on energy would be recommending a water stock. It’s a valid question. Simply put, water is vital to the fracking industry. Every time an oil or gas well is drilled and fracked, hundreds of thousands of gallons of water are used. In fact, the fracking revolution wouldn’t exist without water. Like I said, it’s a necessary input to the fracking industry. Well, the water stock I’m recommending to you today (the “Ultimate Commodity Stock”) not only supplies water to drilling companies, but it also owns and operates a pipeline that sends water directly to drill sites in the Marcellus Shale in Pennsylvania. That’s one of the hidden secrets to the fracking revolution: You can make money by owning companies that supply goods and services to the drilling companies. For example, sand is another vital component in fracking. Within two and a half years of going public in February 2012, U.S. Silica Holdings hit a high of $72 for a gain of 324%. Why such a huge run in such a short amount of time? Because U.S. Silica supplies much-needed sand for fracking. You see, the company I’ve found actually stands to benefit significantly from America’s dire need for fresh drinking water. Which means as our population continues to grow, so too will the need for acquiring water and transporting it to the 13 states this company services. Remember this: There simply is no alternative to water. None! Every other commodity has some sort of alternative. But nothing happens without water. With a bull market being ignited by our nation’s drought and relentless demand for clean, drinkable water, water stocks are on the cusp of an epic move to the upside. The profits are as sure as I’ve ever believed them to be. Posted on July 3, 2016, in ConspiracyOz Posts. Bookmark the permalink. Leave a comment.